Since its formation in 2000, the Quartetto di Cremona has established a reputation as one of the most exciting chamber ensembles on the international stage. Regularly invited to perform at the most important festivals and concert seasons across Europe, South America, the United States and the Far East, the Quartet has garnered universal acclaim from critics and audiences alike for its high level of interpretive artistry. They are a regular feature on radio and television broadcasts around the world (RAI, WDR, BBC, VRT, SDR, ABC) performing their extensive repertoire which ranges from early Haydn to contemporary music. 2017 has marked the release of the final volume in their complete recording of the Beethoven quartets, on the German label Audite. The first volume in the series received immediate recognition, from a five-star rating in BBC Music Magazine to being selected as album of the month by the prestigious German journal Fonoforum. 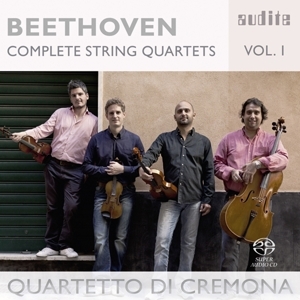 Subsequent volumes attracted similarly high levels of acclaim in the international press, with the Quartetto di Cremona being unanimously considered the true heir of the great Quartetto Italiano. Among their most recent accolades were the Supersonic Award by German magazine Pizzicato and the Echo Klassik 2017 prize, both given to the seventh volume of the Beethoven cycle. In 2011 their recording of the complete quartets of Fabio Vacchi was released on Decca, and in 2012 they released “Italian Journey,” an album exclusively dedicated to Italian composers. The Quartetto di Cremona made a successful debut at the Concertgebouw in Amsterdam during the 2017-18 season, and will return to the new Muziekgebouw in January 2018 for the prestigious String Quartet Biennale. The season will also include tours of the United States, China, Denmark, Germany and the United Kingdom. Recent and upcoming noteworthy engagements include performances at the Laeiszhalle in Hamburg, in Vancouver, Zurich, Stockholm, Geneva and Madrid, as well as ongoing relationships with the major Italian concert halls and seasons. They have collaborated with numerous artists of international renown, including Lawrence Dutton, Edicson Ruiz, Andrea Lucchesini, Antonio Meneses and the Emerson String Quartet. Frequently invited to present masterclasses across Europe and the United States, since autumn of 2011 the Quartet has directed the prestigious Master’s program for professional and advanced string quartets at the Accademia Walter Stauffer in Cremona. The Quartetto di Cremona is an ambassador for the international “Friends of Stradivari” project: thanks to the network, at the moment they are playing on the “Paganini Quartet” by Antonio Stradivari on loan from the Nippon Music Foundation. 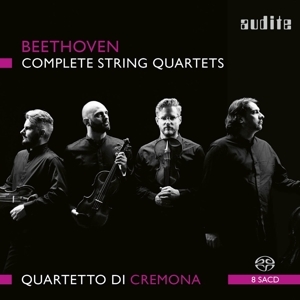 The Quartetto di Cremona is kindly supported also by the Kulturfond Peter Eckes with four fabulous instruments (violin Giovanni Battista Guadagnini, violin Paolo Antonio Testore, viola Gioachino Torazzi, cello Don Nicola Amati) and they are testimonial for Thomastik-Infeld Strings. In November 2015 they were awarded honorary citizenship of the city of Cremona.